Photo above: A street sign in Centreville, Mass. shot by Sean Driscoll and published on JimRomanesko.com. 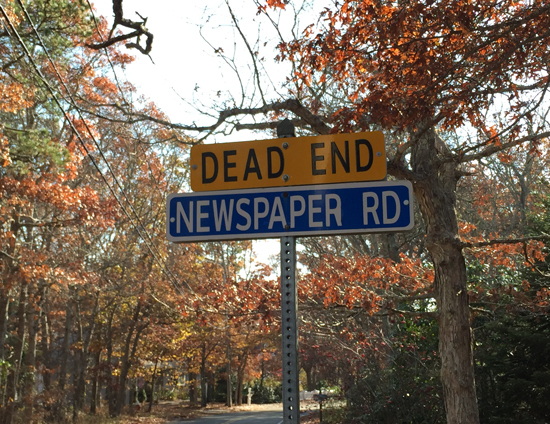 Montgomery County will soon be turning into a news desert, with just one local weekly newspaper left serving a million people in Maryland’s largest county. On Friday, the staff of the Gazette newspapers in Montgomery and Prince George’s counties were told that the papers were folding. They were among the publications sold to Amazon’s Jeff Bezos along with the Washington Post in the fall of 2013. Maybe it’s time to try a nonprofit online news model, say a MontgomeryReporter.com, for this important county. News reports made it sound like it was just one newspaper closing in Montgomery. Actually it was five different editions for various communities in Maryland’s sprawling and probably most diverse jurisdiction, from its wealthiest suburbs in Potomac to its pockets of poverty in Silver Spring and elsewhere. The Gazette operation, once the largest chain of weeklies in the state, had been in a long steady decline — not unlike the rest of the newspaper industry. An expansion into Frederick County, chasing the residents fleeing Montgomery, was shuttered two years ago, and staff was trimmed elsewhere. Andy Schotz, one of the managing editors let go Friday, fully documents the decline and fall of the once mighty Gazette in the SPJ Region 2 blog, the Mid-Atlantic Muckraker. The Bethesda Beat from Bethesda Magazine, one of the few bright spots on the Montgomery County news scene, has a nice historical treatment by Aaron Kraut. There are so many ways that the loss of these once prosperous newspapers is bad for Montgomery County and its communities. The loss of accountability reporting on Montgomery County government, its schools, police and courts is huge. Amateur blogs can fill only some of that. Where last week there were seven Gazette reporters covering countywide and local news, there are now a handful left at the Washington Post, the Sentinel and Bethesda magazine. On the broadcast side, Montgomery is just a slice of the D.C. metro pie. “Citizen journalists” are fine, but there’s nothing like a full-time reporter on a beat to keep you informed about what public officials are doing to you and for you, how they are spending the money they take from you. Press releases from Rockville are not going to do the job. What are we going to do about it, after we’ve done posting our laments on Facebook and Twitter? Beefing up and supporting the Sentinel is one solution, but it is clear the advertising model for newspaper revenue is broken, though weekly and even daily newspapers are managing to survive in other parts of Maryland. AOL’s Patch.com did a comprehensive if uneven job on coverage, with several sites in Montgomery, but it depended on the advertising model, and it never came close to getting that right. It’s worth looking at the non-profit news model, like MarylandReporter.com, the MinnPost, Voices of San Diego and other members of the Institute for Non-Profit News (INN, formerly the Investigative News Network). We held our annual conference 10 days ago in Philadelphia, in association with the meeting of Investigative Reporters and Editors, celebrating its 40th anniversary with 1,700 journalists anxious to learn how to keep probing journalism alive. Non-profit news sites, more than 100 members in INN alone, are financed with a combination of foundation support — about half of revenues — corporate sponsorships, individual donors, memberships, events and advertising. It’s a model much like public radio, but with no government involvement or support. MarylandReporter.com will be exploring such a solution in the coming weeks for Montgomery County. We bought the domain name MontgomeryReporter.com on Friday evening. It’s time for Maryland’s largest and wealthiest county to spend a teeny, tiny portion of that wealth on the professional news that is essential to civic engagement. This will hardly replace the 26 reporters, editors and photographers at the Gazette in Montgomery and Prince George’s County, but it would be a start.